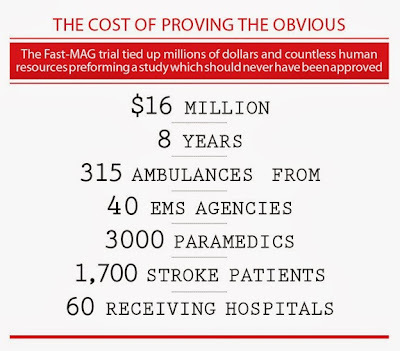 $16M on EMS Stroke Trial? Dr. Rick Bukata Wants His Money Back! FAST-MAG actually has good methodology, so why is Dr. Rick Bukata so upset? Is this just USC vs. UCLA off the field/court? 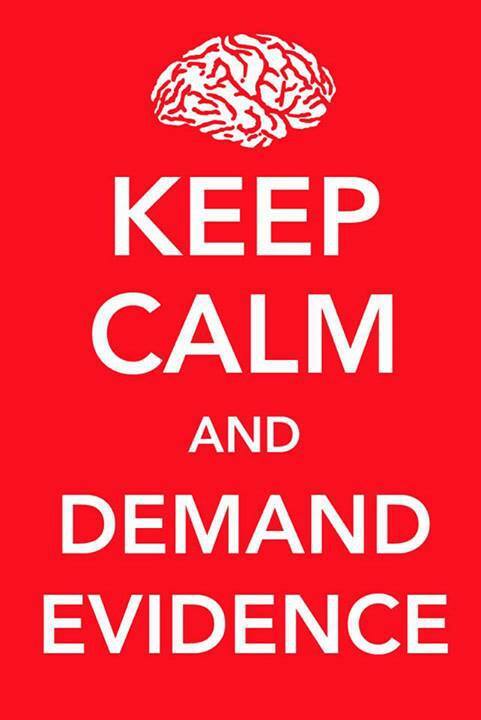 Should the hypothesis being tested have received the Queen for a Decade treatment? He wants his money back? Roughly 160 million tax payers in the US, so $0.10 per tax payer, but he makes more than the average schlub, so maybe as much as 50 cents for him. He can’t even buy enough caffeine to raise his blood pressure with that. In a commentary regarding the IMAGES trial by Larry Goldstein of the Duke Center for Cerebrovascular Disease in the same issue of the Lancet in which the study was published, he noted that of more than 40 clinical trials of “neuroprotectants” involving over 11,000 patients, none has shown any evidence of benefit. Ten years later, the same is true. But look at the animal studies! But look at the time being saved! The authors actually like to repeat the term Golden Hour – as if that is new or valid. So, if you are still a believer in the potential of magnesium, why not try and give magnesium in a pilot clinical study involving stroke patients in the ED? It would have been a relatively simple study to do. It could have been performed in selected EDs throughout the country and the answer would have been established in a fraction of eight years and at a very small fraction of $16 million. 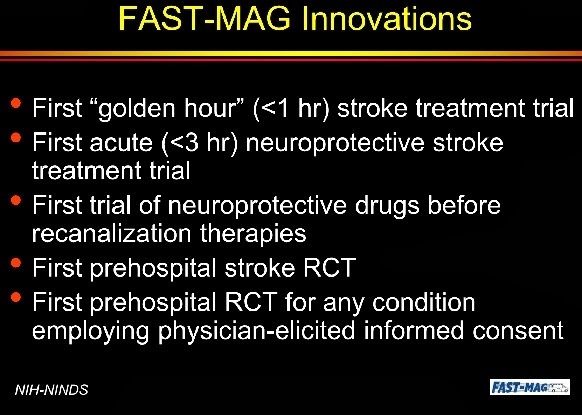 Instead, the Fast-Mag investigators decide that giving magnesium in the field (probably about 10-20 minutes faster than could be given in the ED) would be a reasonable study. Gosh, when he brings reason into the argument, it just seems that the other side has none. What could the money have been spent on? Epinephrine vs. placebo in cardiac arrest? The number of lives affected is large and we are currently treating based on philosophy, not science. IV (IntraVenous) bolus NTG (NiTroGlycerin – GTN GlycerylTriNitrate in Commonwealth countries) vs. SL (SubLingual) NTG for acute CHF (Congestive Heart Failure)? This affects even more patients than cardiac arrest and there is good evidence that IV bolus NTG dramatically improves outcomes, while SL NTG is not based on evidence. Excited delirium treatment with various IM (IntraMuscular) medications to see what is safest and most effective and at what dose. A large trial would be necessary. With no good reason to be optimistic about outcomes, why take this multimillion dollar long shot? 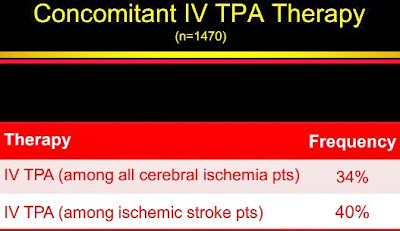 Maybe it has to do with tPA (tissue Plasminogen Activator) and the failure to get emergency physicians to accept the poor research on tPA – tPA showed harm, or no benefit, in 9 out of 11 studies. Ironically, if those studies used methodology similar to this study, that could be showed harm, or no benefit, in 11 out of 11 studies. Dr. Jeffrey L. Saver, one of the authors, has a presentation on FAST-MAG that spends a lot of time on tPA, even prehospital tPA. What does Dr. Sarver consider to be positive about FAST-MAG? Here are some of his slides. FAST-MAG means more tPA use. FAST-MAG means doing a lot of things that have not been done before and expecting the outcome to be good. This is the kind of person who starts turning all of the dials on a ventilator and then looks at the patient to see what the result is. A reasonable approach to research is to limit variables, not brag about how much prudence has been abandoned. 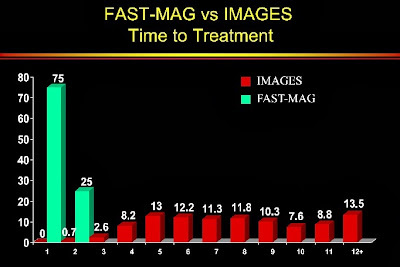 FAST-MAG means time will be saved, but . . . .
Walter Koroshetz, MD, neurologist and deputy director of the National Institutes of Health’s (NIH’s) National Institute of Neurological Disorders and Stroke, sponsor of the FAST-MAG study, says that lessons can be learned from the trial. This is a $16 million bet that time is the only factor that matters. I hope these doctors do not drive the way they gamble. The results were the same as all of the previous studies of magnesium – no improvement. There is no Magnesium Golden Hour. And, please, no – don’t even consider the idea of giving tPA in the field. Well, . . . .
Dr. Saver explained that tPA cannot be given at present in a prehospital setting because hemorrhagic stroke has to be ruled out with computed tomography (CT). The use of ambulances with a CT scanner on board has been studied in Germany and is now starting to be tested in the United States. We need a balance between rushing to add the new cool treatment (and the predictable removal of the treatment decades later) and the inappropriate rush to a large scale trial of something that has repeatedly failed smaller studies. Go read Dr. Bukata’s full article. Methodology of the Field Administration of Stroke Therapy – Magnesium (FAST-MAG) phase 3 trial: Part 2 – prehospital study methods. Saver JL, Starkman S, Eckstein M, Stratton S, Pratt F, Hamilton S, Conwit R, Liebeskind DS, Sung G, Sanossian N; FAST-MAG Investigators and Coordinators. Int J Stroke. 2014 Feb;9(2):220-5. doi: 10.1111/ijs.12242. 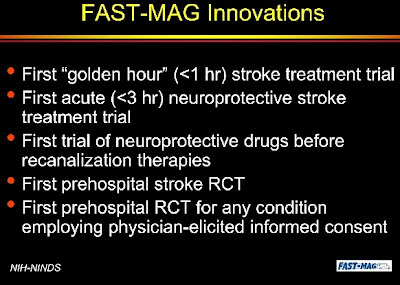 Methodology of the Field Administration of Stroke Therapy – Magnesium (FAST-MAG) phase 3 trial: Part 1 – rationale and general methods. Int J Stroke. 2014 Feb;9(2):215-9. doi: 10.1111/ijs.12243. Epub 2014 Jan 13. 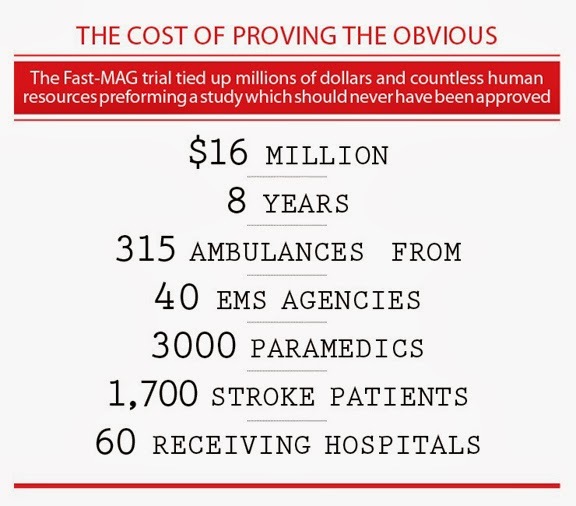 $16M on EMS Stroke Trial? I Want My Money Back! Presentation Slides in PDF Downoad format. Is 50 NTG Too Much for One Patient? Image credit. Three different forms of nitroglycerin, intravenous, sublingual spray, and the nitroglycerin patch. In the comments to Unreasonable Fear of Hypotension and High-Dose NTG – Part I is the following from Kasey Marshall on the patient I treated with over 50 NTG (NiTroGlycerin – GTN GlycerylTriNitrate in Commonwealth countries) for CHF/ADHF (Congestive Heart Failure/Acute Decompensated Heart Failure). My question is how long did the study go on that one patient received over 50 NTG tablets and is still functioning. That patient was not in the study. That was a patient I was treating with over 50 NTG. The patient’s systolic blood pressure (the top number) never dropped below 200 mmHg. I didn’t think that an individual was supposed to receive more than 3 NTG tablets in 5 minutes intervals before professional medical assistance. As used in this case, NTG is an off-label use of NTG, but there is good evidence that high-dose NTG is safe and effective for CHF/ADHF. There is better evidence for high-dose NTG to improve outcomes for CHF/ADHF patients than there is evidence that standard-dose NTG improves outcomes for patients with chest pain/heart attacks/ischemia. Nitroglycerin is indicated for the acute relief of an attack or prophylaxis of angina pectoris due to coronary artery disease. I am professional medical assistance. One reason for the maximum of 3 NTG is to encourage the patient to go to the hospital and not stay home taking NTG, which wears off quickly. Once at the hospital, the patient will often be receiving IV (IntraVenous) NTG. Patients with ischemic discomfort should receive up to 3 doses of sublingual or aerosol nitroglycerin at 3- to 5-minute intervals until pain is relieved or low blood pressure limits its use (Class I, LOE B). By ischemic discomfort, they mean heart attack symptoms, not CHF patients, but they do not provide any evidence. They suggest that there is evidence by writing (Class I, LOE B), but there is not a single reference listed to support this. There is no reference to doses for CHF treatment. Doses for CHF should be much higher than doses for heart attack. I know the earlier NTG is administered, the better but I think that there should be a limit on how much can be can be administered to one patient in a 48 hour period before more serious medical attention should be sought. I have not yet had a transport that came close to 48 hours, so I do not worry about that kind of time period. We should give NTG to CHF patients until it is coming out of the patient’s ears, until the patient’s systolic blood pressure drops by 30%, or until the patient improves. We should be giving IV boluses of 1 mg or 2 mg every three minutes with CPAP (Continuous Positive Airway Pressure), rather than interrupting CPAP to give SL (SubLingual) NTG or using NTG by an ineffective route (paste that is not absorbed through the skin, because circulation is shunted away from the skin). Conclusion: In this single-center, retrospective, unadjusted analysis of primarily African-American patients with acute hypertensive heart failure, nitroglycerin administered by higher dose bolus without concurrent intravenous infusion was associated with a significant decrease in ICU admissions and hospital length of stay. Based on our findings, bolus higher dose nitroglycerin appears to be a viable option for the management of such patients. The IV bolus NTG was better than the IV drip NTG. I know when my mom had a prescription for NTG she was only told to take two, NTG tablets and if a third was needed to call paramedics. And that it was needed two days in a row that she needed to stay in the hospital for observation. I expect that the reason for staying in the hospital was the heart condition that resulted in her taking the NTG. Two doses of NTG will wear off quickly and are not a reason for hospitalization. EMS will probably be giving multiple-dose NTG every 3-5 minutes, often 10, 20, or 30 NTG to one patient for CHF/ADHF. MSN (Multiple Simultaneous Nitroglycerin) is safe and effective for CHF/ADHF. Hypotension was rare and self-limited in prehospital patients receiving MSN. The scary side effect of high-dose NTG almost never happened, but when hypotension did occur, it went away without any need for treatment. Nitroglycerin for Treatment of Acute, Hypertensive Heart Failure: Bolus, Drip or Both? Annals of Emergency Medicine, Volume 60, issue 4 (October, 2012), p. S9. 50 NTG tabs for 1 patient? Holy cow, that sounds labor intensive! This would have been labor intensive. There are 52 NTG tabs in that picture. The study protocol mentioned tabs, but I was using NTG spray. If I had been using tabs, the patient might have ended up being treated for thrush, or for a seizure, due to the white paste in his mouth, rather than CHF. Even with all of the not expired, still potent, NTG spray, his systolic blood pressure never dropped below 200 mm/Hg. Did you have to have another ALS unit intercept to re-supply you with more little brown bottles? The spray level did descent like a low MPG fuel gauge. We were just talking about this today in Medic class. This is a topic that seems to require a lot more time than most others, but after seeing large doses dramatically improve outcomes without any significant side effects, the concept seems to be easier to grasp. I was curious as to why it is alright to give NTG or another Nitrate every 3-5 minutes without worrying about the BP tanking, but didn’t have time to ask. Can you elaborate on this a little for me? I do not worry about why. Failed treatments are often supported by claims that the mechanism is _________. Those are the failed treatments. Similarly, misplaced endotracheal tubes are often accompanied by the words – I saw it go through the cords. We have known since the 1970s that most CHF patients are not fluid overloaded, but people continue to claim that we need to remove the imaginary fluid overload with furosemide (Lasix). That’s a reasonable explanation, but it’s lousy medicine. Expect explanations to be wrong. High-dose NTG works. The improvement in outcomes is repeatable, predictable, and results in many fewer deaths and many fewer intubations. Pathophysiology can be years behind research, because pathophysiology is derived from research, the conclusions of which may be extrapolated well beyond what is reasonable. Pathophysiology tends to lead us to believe that we know more than we do. This can lead to excessive caution, which is dangerous, or to recklessness, which can be just as dangerous as excessive caution being too safe. Based on research, we could probably save half of the patients who will die due to acute CHF, if we would only stop trying to be safe. We are killing our patients with caution and congratulating ourselves on how careful we are. CHF/ADHF (Congestive Heart Failure/Acute Decompensated Heart Failure) patients seem to be resistant to nitrates. This may be similar to giving morphine to someone who has been taking regular doses of an opioid. To treat the patient’s pain, we need to give a much larger dose than would be needed for pain management for an opioid naive patient (no recent opioid use) with similar pain. The same is true for addicted patients, since tolerance is one part of what changes with addiction. In-hospital treatment with nitrates can include nitrate holidays – temporary removal (holiday) of the nitrate to allow the tolerance to decrease. The pathophysiology appears to be that high-dose NTG – especially when given as an IV Bolus – has much more of an effect on afterload (the resistance that the heart is pushing against and part of what is causing the failing heart to fail), than on anything else. Large IV bolus doses of NTG to reduce afterload, even for hypotensive patients, may be the most beneficial drug treatment for acute CHF. Go listen to the very first EMCrit podcast. In under 10 minutes Dr. Weingart explains how to save the lives of crashing CHF patients. Peter Canning writes about a study of high-dose SL (SubLingual) NTG (NiTroGlycerin – GTN GlycerylTriNitrate in Commonwealth countries) by EMS for CHF (Congestive Heart Failure). I have some problems with the study. This is just moderate-dose, not high-dose. I have had protocols that allow for more aggressive dosing (every 3-5 minutes) going back to 2008. I have probably given more triple-dose NTG than was given to the entire intervention group. I have given over 50 SL NTG to just one patient, while they only managed to give a total of 87 tablets in 29 triple doses in the entire study. It is good to provide more evidence that multiple dose NTG is safe, but we have had good evidence that prehospital high-dose IV NTG dramatically improves outcomes since the 1990s. We need more prehospital aggressive IV (IntraVenous) NTG research. However, EMS is the best earliest place to start IV NTG. From 1984 through 1991, new guidelines for the use of intravenous nitrates, based on differential treatment according to blood pressure, were in use. Not just hypertensive patients, but also hypotensive patients benefited from EMS IV NTG! Nitrates were effective in reducing mortality, even in hypotensive patients. Am I complaining that the current study is useless? There is some excellent information that debunks much of the dogma against multiple-dose NTG. Look at the cases of hypotension – systolic blood pressure less than 100 mm/Hg. 3 cases, but only in the double dose group. All of the hypotension went away without any treatment. Zero cases in the triple dose group and the quadruple dose patient did not become hypotensive. Part II will look at the evidence of safety from this study more closely. Nitroglycerin for Treatment of Acute, Hypertensive Heart Failure – Bolus, Drip or Both? Is a half a bottle of nitro too much for a single dose? Page with link to Full Text Download of Full Protocols in PDF format. One of my first medical directors was Dr. Nicholas DeRobertis. 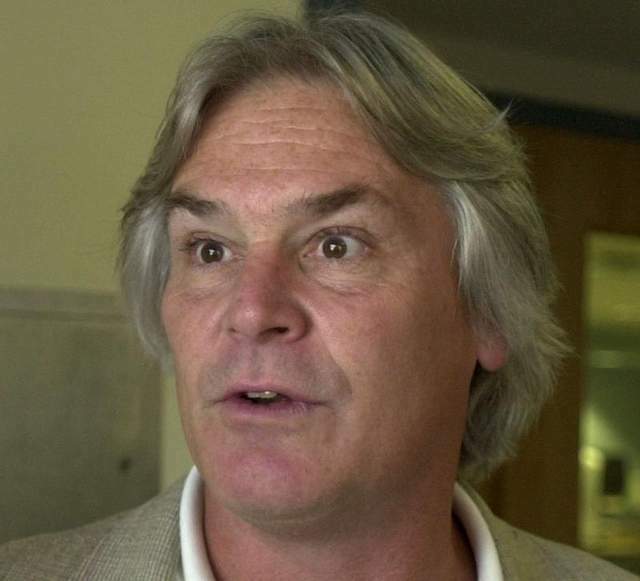 He tried to change the common practice of the local paramedics of dumping intoxicated, or otherwise undesirable patients, at Yonkers General Hospital regardless of which hospital was closest. Sadly, this puerile EMS favoritism is still common in many places. He also tried to change other practices that are bad for patients and bad for EMS. He was at St. Joseph’s on Sunday helping to implement a new electronic medical records system when he began to feel ill. He entered the emergency room he directed for many years – this time as a patient. Friends said he suffered a heart attack. DeRobertis was later transferred to Montefiore Medical Center in the Bronx, where he died late Monday. Dr. DeRobertis, and other attending physicians, would offer continuing education classes for free for EMS, but too often I was the only one attending. He had a lot of work to do to change EMS from the good old dangerous boys club to something that is focused on excellent patient care. We had to call medical command for almost everything back then. I had one patient who was combative due to CHF (Congestive Heart Failure) and called for orders for aggressive NTG (NiTroGlycerin – GTN GlycerylTriNitrate in Commonwealth countries). 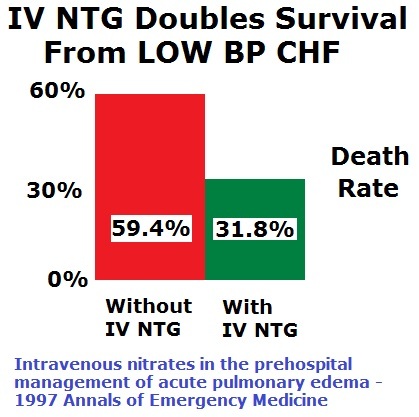 The command doctor refused orders for NTG, with the excuse that “Prehospital nitro doesn’t work.” Even two decades ago, there was evidence that nitrates are the best medicine for CHF. I talked with Dr. DeRobertis and he said that he would make sure that did not happen again. After talking with Dr. DeRobertis, I never encountered that problem again. With Dr. DeRobertis it was clear that good patient care came first, not the doctors, not the nurses, not the most senior medics (often those who have been harming patients the longest), not even the protocol. Back in the 1970s there was good evidence that furosemide (Lasix [frusemide in Commonwealth countries]) does not improve outcomes for CHF patients, but many of us still give furosemide to CHF patients. Dr. DeRobertis was making EMS evidence-based when even in-hospital emergency medical practice was still mostly traditional. His death is is a great loss for his family, his patients, and all of the patients he affected through his recognition of the benefits treatment based on evidence, rather than tradition. Blood volume prior to and following treatment of acute cardiogenic pulmonary edema. The concept that acute heeart failure with pulmonary edema is associated with an increase in intravascular volume is therefore not supported. To the contrary, there is a reduction of blood volume during acute pulmonary edema. This is just one of the studies from the 1970s showing the problems with furosemide. Comparison of nitroglycerin, morphine and furosemide in treatment of presumed pre-hospital pulmonary edema. Free Full Text from Chest. Group A patients (No morphine [received NTG and furosemide]) had the best outcome. No intubations when eliminating morphine. Group B patients (No NTG [received morphine and furosemide]) had the worst outcome. 31% intubated when eliminating NTG. [The use of injectable nitroglycerin (a bolus of 3 mg) in the treatment of cardiogenic pulmonary edema]. Bosc E, Bertinchant JP, Hertault J.
Ann Cardiol Angeiol (Paris). 1982 Oct-Nov;31(6):477-80. French. No abstract available. Bosc et al4 administered one 3-mg intravenous trinitroglycerin bolus to patients with CPE. There was improvement in 71% of the 35 patients studied. Five patients (13%) became hypotensive to an SBP <90; however, each recovered after a few minutes. Emergency treatment of severe cardiogenic pulmonary edema with intravenous isosorbide-5-mononitrate. Am J Cardiol. 1988 Mar 25;61(9):22E-27E. These data indicate that i.v. IS-5-MN is effective and safe for the management of severe acute cardiogenic pulmonary edema. Last night I called in to the EMS Roundtable because the topic was one of the most important in EMS – critical thinking. More simply, in EMS critical thinking is how we make good decisions based on the limited information available in the emergency setting. In EMS we definitely can be too safe. Not applying a tourniquet, because What if the tourniquet causes a problem? That is being too safe. Not giving large doses of NTG to a hypertensive CHF patient, because What if the NTG causes the pressure to bottom? Strapping someone to a backboard with straps and a collar, Just to be safe. How is that not being too safe? Where is there any evidence that spinal immobilization is safe? Not sedating (or not adequately sedating) an excited delirium patient, because What if he stops hyperventilating? These are some of the things that need to be considered when we engage in critical thinking.